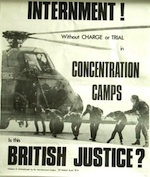 After 40 years, internment without charge or trial has returned to Northern Ireland. In August 1971, the British army picked up and imprisoned 342 men who were believed, often erroneously, to be key members of the Irish Republican Army (IRA). They were never charged with any crime, but they could only be released by a committee that met in secret and gave no reason for its decisions. Martin Corey has no idea why he is back in prison. He was imprisoned for IRA activity in December 1973 when he was 19 years old. He was released in June 1992, returned home, established a business and formed an ongoing relationship. He became a highly respected member of his local community in Lurgan, County Aramgh. More than a year later, Martin Corey is still interned. He was recently told that he’ll be in prison for at least another year because his application for release has been denied, and he can’t reapply until next year. Corey is a member of Republican Sinn Fein, a legal political party throughout Ireland. It is opposed to the present power-sharing administration in Northern Ireland because it believes the administration perpetuates British rule. This can be used to justify Martin Corey’s internment because he is a “dissident republican” and “a threat” to the Northern Ireland peace process. Marian Price, the only woman political prisoner in Northern Ireland, was interned in May. She had appeared in court on a charge of “encouraging support for an illegal organization.” The judge granted her bail, but the police detained her before she could even leave the courthouse. The Secretary of State for Northern Ireland revoked her license from a conviction dating back to 1973. According to the Belfast Telegraph, the minister said that she posed a threat that had “significantly increased” in recent times. Price is a leading member of the 32 County Sovereignty Movement that believes that only an armed struggle can end British rule in Ireland. She is in solitary confinement in an otherwise all-male prison. There are serious concerns about her health. Imprisoned in Britain in 1973, Price went on hunger strike and was force-fed more than 200 times. After she was returned to Northern Ireland, Price developed severe anorexia nervosa and was freed by the British government because they were afraid she was about to die. Today, she is suffering from crippling rheumatoid arthritis. There are probably hundreds of former political prisoners in Northern Ireland who have been released on license. Any one of them could be interned indefinitely at any time for any reason. Ending internment and freeing the prisoners won’t be easy or quick. It will only be won by a movement that brings together everyone who is willing to support political prisoners, whether or not they agree with them politically.